I bet you never thought a Thermomix consultant would ever write a blog about not using their Thermomix. But earlier this year I caught a virus and my health suffered greatly. I would struggle to wake up in the morning and each day I would finish my full time job and come home and crash. On the weekends I would spend the whole day in bed! The doctor couldn’t work out why I was so tired and feeling flat. In the end he prescribed anti-depressants and that was when I schedule my first naturopath appointment. I’m not saying I’m against anti-depressants. Hubby is on them and he was the one that told me not to fill the script. My visit with the naturopath was enlightening and I left with a plan to help me recover from adrenal fatigue. In addition with supplements to take I needed to change my diet. My naturopath wanted me to switch to a low carb high fat (LCHF) diet. LCHF was the complete opposite to what I was eating at the time. I had gone back to an unhealthy lifestyle of fast food. Even though I knew it would be quick to prepare healthy meals with my Thermomix just the thought of preparing food was overwhelming. And I was craving carbs big time! So Dominos pizza and Chinese were constantly on the menu. While my reasons for not using my Thermomix were health related it gave me an insight into why some Thermomix owners don’t use theirs. Cooking with a Thermomix saves time and makes it easy to cook from scratch which cuts out additives and preservatives. But it is a new way of cooking and it can take a moment to get used to which can make it feel overwhelming. Which is why I love the recipe chip. It’s like a set of training wheels and when you feel like you have the hang of all the functions you can cook manually and convert your own recipes. And if you are having any issues using your Thermomix all you have to do is contact your consultant. 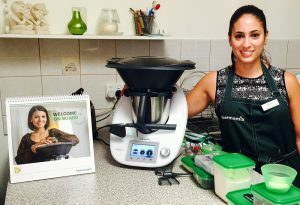 Your consultant is there with you for your whole Thermomix journey and ready to help in any way. And if you want some more help then I would suggest you read The Road to Loving my Thermo Mixer blog where she challenged herself to use her Thermomix everyday and finally fell in love with it. You can check it out here.